Difference between revisions of "Union of Central Western Territories International Airport"
The new UCWTIA has been pasted, and all airlines will need to repaste in their planes and update their warps (gate assignments are below, and signs are placed on the tarmac for clarification). The immediate gate area may be decorated or left as-is. Check-ins from the previous version are carried over and do not need to be redone. Additional gates may be requested in the talk page. Note: All standard gates have been reduced to 41 in width, so please adjust your plane accordingly (after the renovation) if necessary. 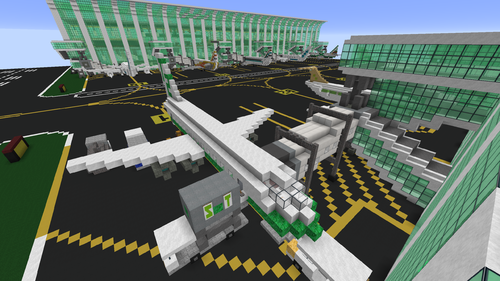 The two existing large planes (Derpy Air and AirLinQ) will be given a 53-wide gate each. The Union of Central Western Territories International Airport is an operational airport located just southwest of Central City within the UCWT SMP, of which it serves. It is currently fully operational. 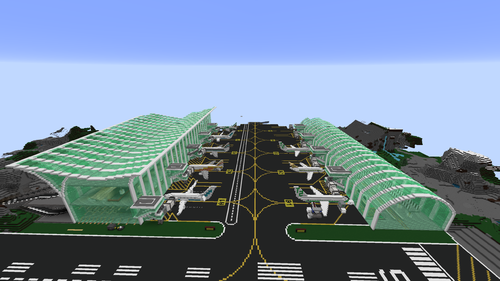 UCWTIA was originally planned by RLcrafters to be built just north of Sealane between A0 and A8. However, this plan was rejected at the February GSM due to reasons of the airport not being in a centralized location of the UCWT SMP. A second plan was then submitted for the March GSM, in a more centrally located position south of Sealane and east of Danielston, and was then approved. Construction on the main airport facilities were done in lab and then w/e into UCWT, and other facilities such as roads, parking garages, and amenities outside of the airport were constructed on-site afterwards. In April, the airport was rebuilt to be able to accommodate more gates, of which it has doubled. The airport is arranged into a main terminal with 5 concourses as prongs. The main terminal is divided into two floors, one for departures and one for arrivals, with services spanning the entire length. The upper floor contains check-ins and security, while the lower floor contains immigration, baggage claims, and customs, as well as some franchises. The concourses consist of walkways on the departures floor connected to ramps leading to the first floor, which is arranged such that there is a seating area for every 2 gates with the arrivals walkways dividing them. The main terminal is in the north, with 5 concourses lettered A-E from west to east immediately south of it. There are 36 gates, with 24 (concourses A-D) holding regular sized planes, 3 holding large planes, and 5 holding medium planes. Small planes and helicopters, located south of the main taxiway, can be accessed through a shuttle bus system stopping at the south end of concourse E, and the east, central, and west areas of the small/heli gates. Security is of the utmost concern for the airport, and is not to be taken lightly. For departures, the traveller will first proceed to security, present their flight ticket and passport, then proceed through either a metal detector or millimeter wave scanners, while any items that are carried are subject to an X-ray machine scan. Upon arrival (all flights are considered international), travelers will proceed through either passport control for citizens of UCWT (automatic if you are enrolled in the program) or immigration for visitors, then through a baggage claim and to customs where any listed items must be declared, under penalty of seizure of that item and/or fines. Anyone unable to pass through either or both of these security checkpoints will be detained by airport security and/or deported. All airport security is provided by the Formosa Armed Forces Terrestrial and Aether Home Guard, who regularly patrol the airport terminals, its airspace, and its grounds, including taxiways and surrounding transit systems. The location of the airport's main transit hub is located under the main terminal and accessible by escalator on the west end. In addition, public and shuttle bus stops are located all along the inner ring road of the landside faces of Terminal 1, while drop locations for private vehicles line the outer ring road. Roadways connect the airport to surrounding roadways as well, with eastbound serving as the ring road of Terminal 1. has roadway connections to B50 via Memorial Fountain Circle in the west and in the east. Several franchise spaces including food, shopping, and other services are available on the arrivals floor landside. Several airport hotels may be built around the area for travelers requiring stay at the airport for early flight departures, late flight arrivals, a place to sleep for the duration for the visit, or any other reason. They will all be accessible either directly from the terminal or by shuttle buses provided by the airport or hotel. 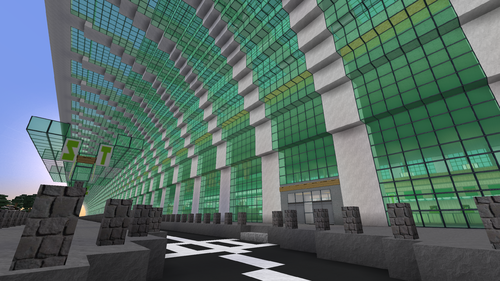 A small military airfield has been built to the southeast of the main terminal, for the usage of Formosa's Armed Forces and select allied forces to provide aerial defense of UCWT. Access is strictly limited to military personnel with the necessary clearance. The airfield grounds is surrounded by a fence with a gate adjacent to the taxiway, and includes a watch tower and command building. Allied forces are welcome to use the airfield as well. A large control tower is situated just west of the runway, and is connected to the main terminal by an underground walkway. The tower contains a control center for all flights within UCWTIA airspace, as well as a command center for FAF and AFS, and an observatory deck open to approved visitors. A12 was the first gate to be constructed at the airport, and several trolls by several players were left in, on, and around the gate desk, gate, and jetway. 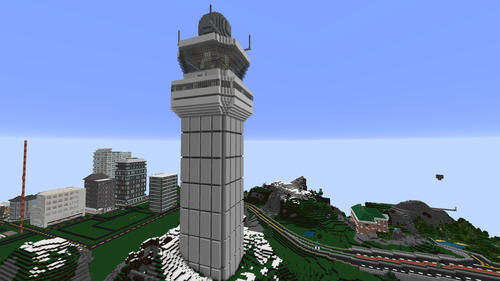 UCWTIA is the first new world airport with a control tower separated some distance from the terminals. It is also the first SMP airport to use the land allocations of at least 2 cities. Construction started on April 9, 2016 in the lab world, with several different people helping with building various things. Terminal 1/Concourse A was finished in the lab and Terminal 2/Concourses B and C were finished on-site. 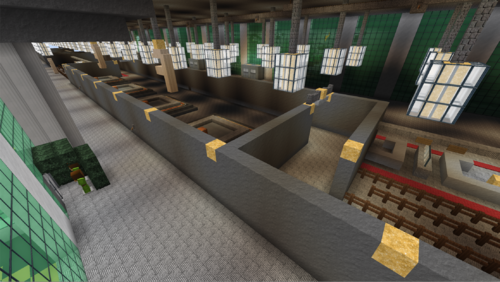 Construction of the second version started on April 16, 2017 in singleplayer, and was pasted in on April 17, 2017. 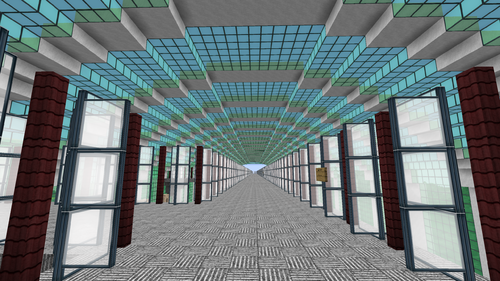 A large bilevel rail hub, constructed by FredTheTimeLord, is situated under the western portion of Terminal 1. It is served by BluRail, Fred Rail, HSRC, and IntraRail. Great Central, RaiLinQ, and RegionalConnect have different stations situated at or past the east end of Terminal 1. BusLinQ, IntraBus and Sealane operate buses on the departures inner ring road. Formosa Take south to Memorial Fountain Circle, then take the east exit until the UCWTIA ring road. Take east, then take Exit 2 to head west, then take Exit 3 and drive to the end at Memorial Fountain Circle. Danielston Take north to Memorial Fountain Circle, then take the east exit until the UCWTIA ring road. Take east, then take Exit 2 to head west. Take Exit 3 and drive to the end at Memorial Fountain Circle, and head south on . Sealane/Golden City Take west to the end at and head south, then take the east exit at Memorial Fountain Circle and drive until the UCWTIA ring road. Take east, then take Exit 2 to head west. Take Exit 3 and drive to the end at Memorial Fountain Circle, then take north until and head east. Central City Take south until , then drive west to the end. Take east until , then drive north. Checkin desks are found on the departures floor in the main terminal. They correspond to the order of dropoff locations outside the airport. Gates in Concourses B-D are arranged such that each successive gate number alternates between the concourse's sides from west to east. Concourse A has all its gates lined up on the east side, and Concourse D's numbering goes down the west side, and then down the east. Ground gates are numbered from west to east, and heli gates are numbered west to east, then north to south. A typical plane landing at UCWTIA from the south.